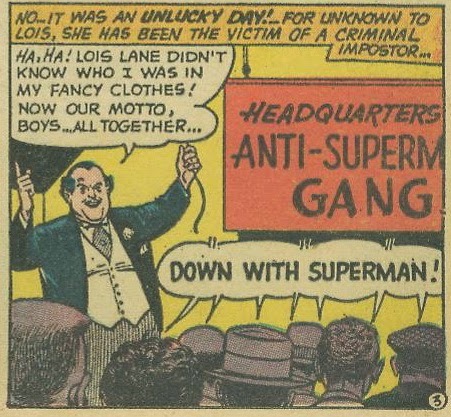 Did the Anti-Seperman Gang ever meet the Superboy Revenge Squad? "I'd explain what goes wrong, but it's even more convoluted." For interested readers, Siskoid's Blog of Geekery has a more in-depth look at the story. Perhaps I'm hallucinating (again), but I seem to remember at least one story where the A-SG all wore Superman costumes with the S-shield in glowing green, as in kryptonite. Does anyone else remember that? Diane, I remember that too, though I can't recollect which story/issue it's in. I do recall one of the crooks saying something like, "Oh (gasp! ), it's beautiful! I can't wait to get mine on!" 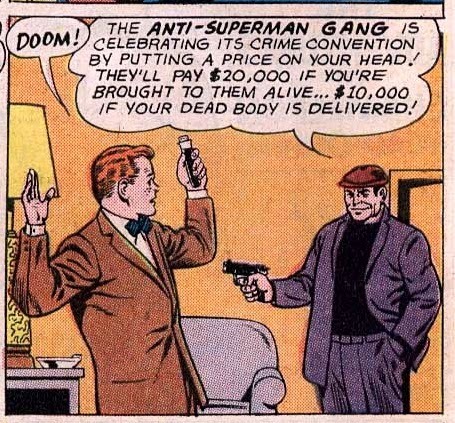 That could have killed the Silver Age all by itself. Any truth to the rumor that a modern version of the ASG produced the last Superman movie? 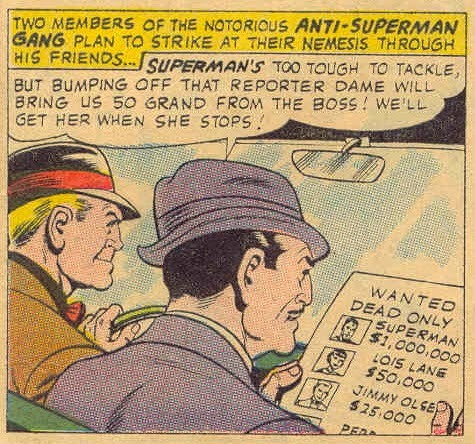 Diane, I suspect that is the Superman Revenge Squad, probably from the cover of World's Finest #175? Pat - You're absolutely right. That's the cover I was thinking of. Pat - It is. That's exactly the cover I was thinking of.